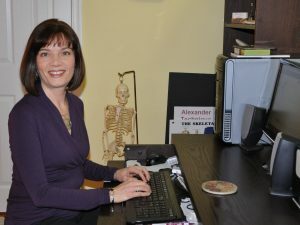 Imogen first learned how to create her own website to promote her own Alexander Technique practice in Wilmington, Delaware. She took two online web design courses and then set to work. Her goal was to have a clean, professional look, with easy-to-digest information on each page. 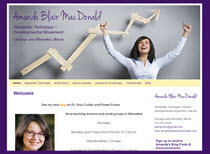 She enjoyed the creative process so much that when Robert Rickover, Alexander teacher and creator of The Complete Guide to the Alexander Technique, approached her regarding the possibility of designing websites for other Alexander teachers, she jumped at the chance. Imogen started designing websites using html code. It was becoming, however, more and more apparent that many of her clients wanted to be able to edit their sites themselves, rather than be reliant on Imogen to make the updates for them. Imogen understood this need well – it was, in fact, the main reason she learned to design websites for herself. WordPress was the answer. Originally a blogging platform, it has now become a comprehensive content management system. It can be used to create websites, blogs, or a combination of the two. And the great thing is, you can edit the content yourself without needing any specialized knowledge. In the summer of 2011 Imogen took another online course to familiarize herself with the ins and outs of designing with WordPress. Although WordPress sites are actually blogs, Imogen learned how to turn them into proper websites (of which this website is an example!). Of course, a blog can easily be incorporated if desired by the client! For this reason, and all the added functionality, Imogen now uses WordPress for her own Alexander Technique website at www.ImogenRagone.com. To date Imogen has created over 100 websites for Alexander Technique teachers in three continents – recently these have all been designed using WordPress. Imogen now uses the WordPress platform for all her sites. Even if you don’t want to do any editing yourself, or have a blog, a WordPress site offers state-of-the-art design and function. And, if you do want the ability to easily do updates yourself – or have a blog as part of your site – a WordPress site is the perfect solution.